Laser Printers, Plain Paper Fax Machines and Copiers all operate in the same manner - an enclosed print head and guide path to reproduce copies. These inaccessible parts can trap all kinds of harmful debris resulting in blurred or missing text. This unique Cleaning Paper is specially treated to attract and remove accumulated toner residue, harmful paper dust, debris and other foreign matter from the paper path of your machine. Regular use, especially after changing a toner cartridge or extensive copy output will prolong the life of your equipment and ensure better reproduction of clean, crisp and professional looking documents. This paper is non-toxic and will not leave any residual chemicals inside the equipment. 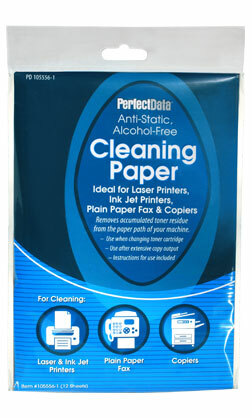 Easy-to-use sheets run through paper path same as regular paper for easy one-step cleaning.